Do Modern Corn Hybrids Still Exhibit Imbibitional Chilling Injury? Emergence of corn hybrids planted on April 14th after encountering cold rain and snow 21 to 30 hours after planting. Imbibitional chilling injury to corn purportedly occurs when recently planted corn seed imbibes water at temperatures less than 41oF (although some say 50oF) during the first 48 hours after planting. We have planted corn a few times over the last 30 years when temperatures have been in the 40s or upper 30s, even with a little snow falling. Sure, final stands have not been perfect when planting under these conditions, but on almost all occasions, final stands have been satisfactory. So I must pose the question, as once again we have encountered poor conditions shortly after planting in April of 2014, and have had not perfect, but certainly satisfactory corn stands. Do modern hybrids still exhibit imbibitional chilling injury under field conditions? Table 1. Days to emergence, averaged across two corn hybrids, planted on five dates and at five depths at the Aurora Research Farm in Cayuga Co. in 2014. 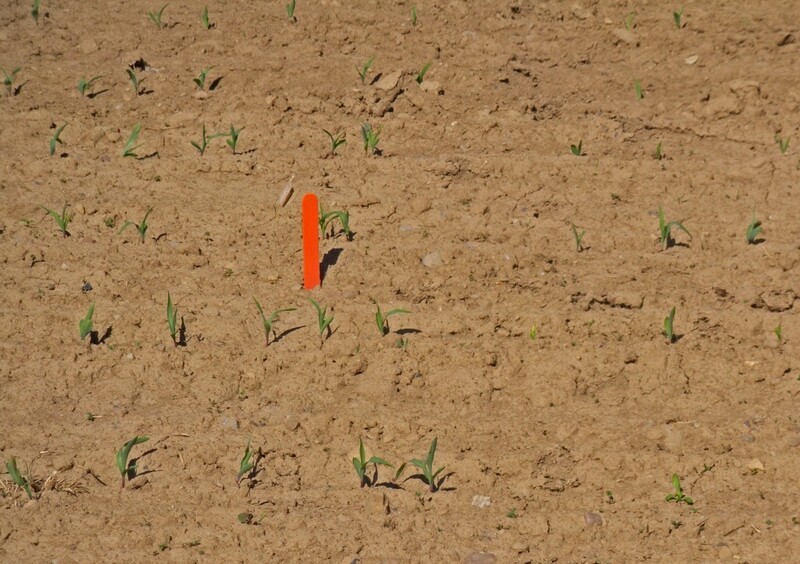 We planted two corn hybrids at our recommended seeding rate of ~32,000 kernels/acre at five seeding depths on April 14, April 21, May 7, May 20, and May 31 on a well-drained soil at the Aurora Research Farm in Cayuga Co. We have not had time to conduct statistical analyses on the data nor have we taken early plant population counts on the May 20 and May 31 planting dates yet. We do have days to emergence for the April 14, April 21, May 7, and May 20 planting dates and early plant populations for the first three planting dates. Table 2. Early plant populations, averaged across two corn hybrids, planted on five dates and at five depths at a seeding rate of ~32,000 plants/acre the Aurora Research Farm in Cayuga Co. in 2014. When averaged across the two hybrids and five planting depths, corn emergence occurred about 27 days after planting for the April 14 planting date, about 21 days after planting for the April 21 planting date, and about 7 days after planting for the May 7 planting date (Table 1). When averaged across hybrids and planting depths, early plant populations averaged about 27,000 plants/acre for both April planting dates, an average emergence rate of about 85% (Table 2). Table 3. Hourly temperature and hourly precipitation during the 48 hours after planting two corn hybrids at five planting depths on April 14 at the Aurora Research Farm (read the table from the bottom to the top to track temperature and precipitation during the first 48 hours after planting). In contrast, early plant populations averaged about 28,500 plants/acre for the May 7 planting date, an average emergence rate of about 90%. Clearly, the May 7 planting date resulted in better stand establishment, but were the April planting dates that unsatisfactory, given the conditions in the first 48 hours after planting corn? Table 3 indicates that temperatures were in the 70s during the afternoon of April 14. Temperatures, however, dropped into the upper 30s, 21 hours later, accompanied by a cold rain for three hours (8:00-11:00), followed by an accumulating snow for the next few hours (12:00-16:00) on 4/15. Temperatures then dipped down into the lower 20s (a low of 21.7!) during the evening of 4/15 and remained in the 20s throughout the day of 4/16. Climatic conditions were not as inhospitable after the April 21 planting date but Table 4 indicates that 36 hours (4/22, 3:00) after planting corn, temperatures were in the upper 30s accompanied by a cold rain. Temperatures remained in the upper 30s throughout the day of 4/23. Both April planting dates thus had temperatures below 41 degrees in the first 48 hours after planting, accompanied by a cold rain and even snow. The field was plowed and harrowed so soil temperatures closely tracked air temperatures, especially in the top 2 inches. Yet, emergence rates averaged 85% for the April planting dates compared with 90% emergence for the May 7 planted corn, which encountered almost ideal conditions in the first 48 hours after planting(temperature range of 52 to 81oF). Was the 5% lower emergence rate for the April planting dates due to imbibitional chilling injury? And if imbibitional chilling reduced emergence by 5%, should it be cause for alarm? Or should we just continue to recommend that growers assume an 85% emergence rate for April-planted corn and a 90% emergence rate for May-planted corn in NY? Table 4. Hourly temperature and hourly precipitation during the 48 hours after planting two corn hybrids at five planting depths on April 21 at the Aurora Research Farm (read the table from the bottom to the top to track temperature and precipitation during the first 48 hours after planting). One criticism of inferring that modern hybrids may no longer exhibit imbibitional chilling injury, based on data from this study, is that we examined only two hybrids. In 2012, we planted our corn silage hybrid trial with 82 entries on April 20 at the Aurora Research Farm in Cayuga Co. when the high temperature was 78 oF on the day of planting. 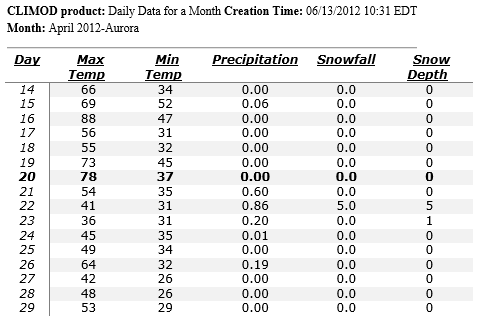 Only 24 hours after planting, Aurora received a cold 0.6 inches of rain, followed by 0.86 inches of precipitation in the form of a 5-inch snow storm during the next 24 hours after planting (Table 5). Obviously, weather conditions were conducive for imbibitional chilling damage during the initiation of the emergence process in the 2012 study. When averaged across the 82 hybrids entered in the study, early stand establishment averaged 85.4% (Table 6). Stand establishment averaged from about 84 to about 89% for the hybrids from the 12 seed companies. Of the 82 hybrids entered in the study, only six hybrids had stand establishment rates of less than 80% on this drained Lima silt loam soil. So, I must once again pose the question. Do modern hybrids still exhibit imbibitional chilling injury under field conditions? Based on the circumstantial data from the 2012 and 2014 studies, I would say maybe not. If modern hybrids do exhibit imbibitional chilling injury, the timing of the adverse conditions would have to be so unique and so time-dependent in the first 48 hours after planting that it may not be worth worrying about. Keep in mind that these studies were conducted on well-drained soils. If we had planted corn on poorly drained soils and encountered such weather conditions after planting, corn emergence would have been much lower. But it probably would have been associated with flooding damage and not with imbibitional chilling injury. Table 5. Weather conditions at the Aurora Research Farm from April 14-April 29 in 2012. Emboldened date indicates the weather conditions on the day of planting. What happens if soil conditions are conducive for a mid-April planting date next year but very cool wet weather (even snow) is forecast for the next few days? I will continue to plant corn any time after April 10-15, provided soil conditions are dry, the location does not experience late spring killing frosts (< 28 degrees after May 15 or so) and the soils are well-drained and do not readily flood. Table 6. 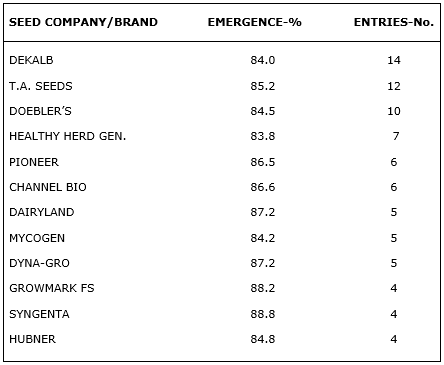 Stand establishment rates of 82 hybrids from 12 seed companies planted on April 20th, 2012, 2 days before a 5-inch snow storm. I would adjust my seeding rate to account for only 85% emergence and plant at a soil depth of 1.5-2.00 inches. Let’s hope that most corn growers in NY get that opportunity next year and don’t have to go through another spring like this year!!! !